Harper - you are 10 months old! You are an eating machine. You eat pretty much anything I give you - which is a lot. You love carrots, avocados, bananas, cheese, sweet peas, sweet potatos, peaches, pears and pretty much anything else. You are completely weaned and LOVE your bottle. I can't believe how easy it was to wean you and how great it has worked out. You take a good 1-2 hour nap every morning but refuse an afternoon nap. You are mostly sleeping through the night now. You go to bed early (because of the no afternoon nap) and sleep from around 6 to 6. You spent a week away from us for the first time. You stayed with your grandparents while we went on a mission trip. I think we couldn't believe how great you did! You have so much personality and the brightest eyes. You are SO social! You are SO vocal and are constantly talking and making noise. The only "real" word you say is Dad-da. But I know once you get going we will never get you to be quiet. You are going to be a talker! You have EIGHT teeth! Four on top and four on bottom. And they are BIG teeth! You never stop moving. You are constantly crawling, standing or pulling up on things. You stand by yourself a lot now. When you get a little steadier - you will most likely walk. I know you will be walking by your first birthday if not sooner! You clap your hands all the time! Especially when you think you have done something Great! You have changed SO much. I look back at your earlier months and can't believe you big you are now. I still can't believe you are MINE! ohmigosh that last picture is ADORABLE!! I cannot believe she is 10 months old!! That means that Johnson will be 11 months old in 3 days!! :( Oh, time flies!!!! He has 8 BIG TEETH too!! It is TOO FUNNY!! She is adorable! Happy 10 months, Harper! Such a sweet post, and she is so adorable and getting so big! Can't believe that she'll be walking! Harper is so precious! Happy 10 months! Sounds like Harper has the same schedule as my daughter. She fights an afternoon nap so she goes to bed anytime between 6 and 6:30. Happy 10 months! I love the pictures! She has such big beautiful eyes! If you would rather that she take an afternoon nap, you can do what I did, and just cut the morning nap short (like 30 minutes only) so that she takes an afternoon nap. It is extremely helpful now that I have two, and they nap at the same time every day--together! I'm nervous about next spring when #3 gets here, but I work hard to get them on schedules to keep me sane! Happy 10 mths Harper!! She is getting so big! How precious is her little polka dot dress!! What a doll!! She is a doll! And you Kelly are a great mommy. I can just feel the love you have for Harper in your writing. Happy 10 months, sweet Parker! You are a doll and clearly something very, very special to your mommy! You're a lucky girl to have her. Happy 10 Months Birthday Harper! You are so beautiful! Have a wonderful day! Wow. Just made a goofball out of myself. Where did PARKER come from? HARPER! Happy 10 months, HARPER! TWO more months!!! Can you believe it??!! She is just precious!! It's hard to believe that she is almost 1. I think she gets cuter every day. Such a doll! :) Happy 10 month Birthday, sweet girl!! Awww she's cute as a button! Happy 10 months Harper. 10 months!!! it goes by so fast doesn't it? she is adorable and as always i LOVE the outfit! Harper has the most beautiful big eyes!! She reminds me so much of my Carlie when she was little! She's such a doll!! TEN?! Does not seem possible at all. What a happy child! She's a sweetheart for sure! 21 pounds!!! I can't believe this is the same baby that was struggling ten month ago! Very sweet pictures.... I know you are already thinking of birthday party ideas- can't believe it is that close! Happy 10 Months Harper! You are starting to look like your Momma!!! Happy 10 Months Miss Harper! SHe is so precious! What a blessing she is. Our little ones do grow fast, but when they turn 1, boy are they fun! My daughter just turned 1 and it's so fun to "hang out" with her. She is truly becoming mommy's little friend. SO PRECIOUS!!!! Can't believe she is 10 months and AK is 6 months this week. NOT POSSIBLE! :) Have a great week, Kelly! So so sweet! Precious baby girl! Doesn't it go by way too fast??? And, she will NEVER stop talking...trust me. Harper is getting so big! Time flies huh mommy? :) Well, I have been a follower and a prayer warrior since Harpers birth and you have inspired me with your faith. My nephew Carson was born early yesterday morning at 30 weeks. He weighs 3 lbs 8 oz and so far is doing fantastic! He was mediflighted to Baptist Hospital in OKC from another OKC hospital that just wasnt equipped for a 30 weeker. As of last night he was already taken from the vent to CPAP and is doing awesome! I am saying this because I have thought back to you and Scott's time through the NICU and your unwavering faith and that has held me strong. Carson WILL be okay, he is in God's hand right now. I pray that his other hand if firmly around Kasey (my sister) because I can't imagine what she is struggling with right now. I know this isn't the prayer blog, but if anyone reading this would just say a quick prayer, we greatly covet those right now. Thank you so much! Happier note, since Harper was so easy to wean to the bottle, I believe she will be incredibly easy to wean from the bottle when you decide. Both my girls were taken off the bottle at their first birthday and did famously! Congrats again on your Compassion trip. Harper will be incredibly proud of her parents! Happy 10 months beautiful baby girl! Happy 10 month Birthday Harper! It is so odd how much our little girls are alike. 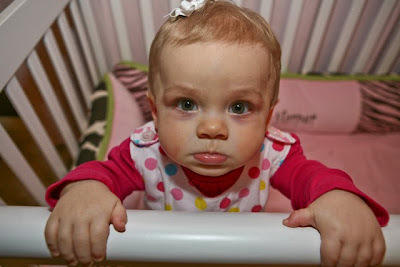 I am working on Emma's 10 month post right now! Have a great (10 month) birthday! Happy 10 months Harper!! You are too cute!! Hi Kelly! I need a little mommy advice! I have a 10 month old, too, and was wondering if you use breast milk or formula in Harper's bottles? The only reason why I ask is because I'm thinking of maybe weaning soon, or at least cutting back (my little boy still nurses SIX times a day and sometimes all night long, too!!!) and was wondering what formula Harper takes (if you use it). THANKS!! I cannot believe how close she is getting to being a year old!! Little Harper is getting so Big! Are you sure she is 10 months old?! I think your math is wrong. :) KIDDING, just can't believe time has gone by sooooooo fast! She is mighty adorable! You mentioned in a tweet that you are going to get Harper a new car seat. Can I pop in with a couple of suggestions? Definitely look at the Sunshine Kids Radian80 or XT - these rear face to 45lbs (rear-facing is 5 times safer than forward-facing and so the recommendation is to rear-face for as long as possible) then they forward-face to 80lbs, or until outgrown by height. The seat also folds and so is great for air travel, if you ever foresee that for Harper. If you would be so kind to check out http://www.hipmonkey.com for car seats, that would be wonderful. All proceeds go to the Kyle David Miller Foundation (which I run) which donates car seats to low income families across North America. Other seats to check out at the Graco My Ride 65 - rear-facing to 40lbs and forward-facing to 65lbs, or until outgrown by height. The Britax convertibles are all fabulous - the Marathon and the Boulevard both rear-face to 35lbs and the forward-face to 65lbs (or until outgrown by height). Both the Sunshine Kids and Britax brands are available on Hip Monkey, Have fun shopping and don't hesitate to ask me any questions - I am a certified child passenger safety technician. I saw someone mention car seats, we found a good sale on Britax at babyage.com and we love ours!! (sorry it wouldn't let me copy the pic). She LOVES them, so much that if you try to take them off she crys and puts her foot up to get them back on!!! Happy 10 month birthday Harper...you are beautiful child!!! Kelly...you are a very lucky Mommy!!! OH MY WORD! I do not think that baby could be any more darling! Just adorable!! Kelly, she is a doll baby! Happy 10 months, Harper! You are precious. and she is getting cuter by the day!! Harper, can you really be 10 months old?!?! Time goes too fast! You are as beautiful as ever! I am glad you are taking your bottle and sleeping so good for your momma! HUGS! Cilla wants to hang out with you again soon! You girly girls would have lots of fun together now that you are so mobile! Wow, she is growing up so fast!! She is just adorable. Happy 10 month birthday Harper! 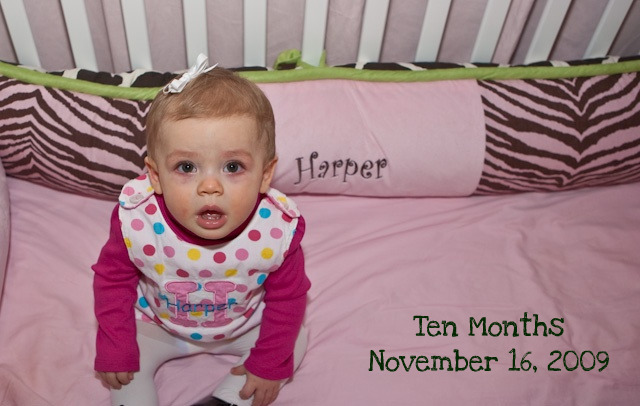 Happy Ten Months Harper! Looks like you are going to have to change where you take her picture pretty soon! She is a doll! How sweet! What a blessing and beautiful little smile. Almost time for the big 1st Birthday!!! she is so cute! Happy 10 months Harper!! She is just so cute Kelly!!! I can't believe all the teeth she has! Harper often looks like she has something to say! It cracks me up! She is so precious :) Thanks for sharing the pics. This is one of my favorite ages! So much personality but still some sweet baby peeking through. She is so precious! Harper & my daughter,LilaKate, sound a lot alike. She is 16 months old, but around 13 months quit taking her afternoon nap. Over the last 3 months, I've been able to scoot her morning nap from 9-11 to 12-2. It took a bit, but she also goes to bed early. She pretty much sleeps from 6:30- 6:30. It's nice in the evenings because I also have 2 boys that are 15 & 10 and I can spend time with them. Enjoy every moment with your precious Harper...before you know it she'll be turning 16 and driving a car... it happens in the blink of an eye! Oh my goodness, she is so adorable, those eyes melted my heart! Sweet girl! 10 months, WOW!! I cant believe I have been reading your blog that long already. She is just as beautiful as the day she was born. I cant wait to spend the next 10 months reading about her. I look forward to reading about her everyday!! Happy 10 months Harper!! I have a question. I just sponsored a child through Compassion from El Salvador. Is it okay to share her pic on my blog? I came to know you when it wasn't known if you were going to make it - it warms my heart to see you growing and doing so great! She is changing and growing so much! Happy 10 months Harper!! Happy Ten Months Birthday Miss Harper!! Wow, time sure does fly. It seems like only yesterday, you were leaving the hospital with her.Enjoy every minute. 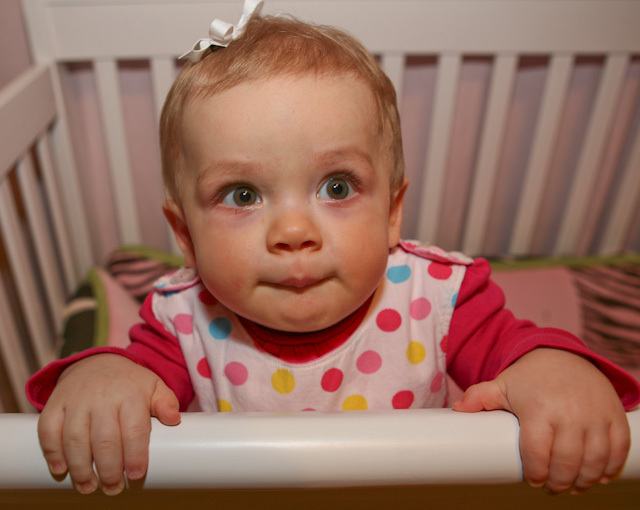 Happy 10th month birthday,sweet pea!" I've been reading about you since the day you were born and look forward to the next 10 months! Kelly, she is just beautiful!! 10 months! That went by really fast. She is so darn cute and I love all of her facial expressions. Once again, thanks for sharing her with us. just wanted to let you know that I have been reading your blog since Harper was born. I found it through one of my friends blogs when everyone was praying for a great recovery for Harper. I just wanted you to know what an inspiration you and your family are to me and mine. I didnt want to just 'blog stalk' forever and thought I would let you know that sharing all of your struggles with infertility and such has been an inspiration for the rest of us! I even sent your blog to a family member who had a little one who had some of the same issues as Harper, when her little one was born. It helped her a lot to see it through someone else's eyes and to see such a great outcome! Love your pics. I was wondering what type of camera you use. I was trying to find your email, but couldn't find it. is she really 10 months already?? ?